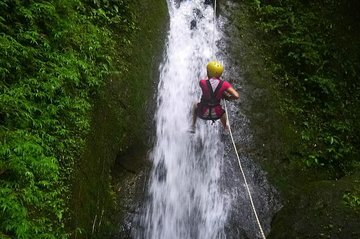 Esplora una foresta pluviale costaricana in questo tour in rappel da La Fortuna. Dopo essere stato equipaggiato con la tua imbracatura e il tuo equipaggiamento, calati in discesa con sei discese diverse, inclusa una cascata, per un totale di circa 100 metri. Termina il tour con uno swing Tarzan seguito da un giro a cavallo o un giro in carrozza attraverso la foresta pluviale. This is not near La Fortuna. Expect a 1 hour or more drive from La Fortuna to this Tour. I was disappointed in having to make the contacts to the tour company for travel which was included and then after arranging the time it changed the night before. However, the tour guides were great and the tour experience was wonderful. Giving 3 Stars for the location as well as the lack of contact to arrange travel.